ARS Technica has another piece about BitCoin, an encrypted, peer-to-peer digital currency that is becoming increasingly hot. Unlike traditional currencies like the US dollar and the euro, Bitcoin does not have centralized intermediaries and does not allow the creation of money out of thin air. Details on how it works can be read at ARS. Over the last couple of months the value of Bitcoins has increased at an astonishing rate. 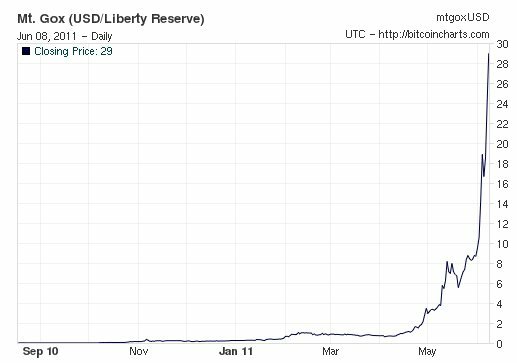 Six months ago a Bitcoin was worth just $0.30 but around April its value started soaring at an increasingly exponential rate. After breaking through the $10 mark for the first time last week, a Bitcoin is now worth roughly $29.